A friend and fellow alumnus of UC Santa Barbara sent me this LA Times editorial. It seems that UCSB students can now opt out of any class material that might upset them. In the words of my student days, it just blew my mind. Totally weird, man—WTF?? University is supposed to be about expanding one’s viewpoint, learning about people from other cultures, races, and economic backgrounds. I know I learned about things I had never thought of before, and my friends and I had long discussions far into the night, throwing ideas back and forth. Things were a bit more dire in my day; my boyfriend got a seriously unlucky draft lottery number during the Vietnam War, a war we didn’t believe in–right after he flunked out. Not to mention Martin Luther King and Bobby Kennedy being assassinated one right after another, not that long after JFK. Those were some scary times, plus the fact that we faced major police brutality and had our town placed under martial law. So, excuse me if students opting out of potentially upsetting classroom material in an institution of education threw me into a tizzy. Talk about cognitive dissonance. It also galvanized me. About three years ago, I wrote a short book about my senior year at UCSB, 1969-1970. I participated in the Vietnam War Moratorium, when millions marched in San Francisco and Washington DC. I was tear-gassed during the Isla Vista riots, harassed by police, and I saw the Bank of America burn. After reading the latest news about my alma mater, I hauled that manuscript out of its drawer and decided to self-publish it as an ebook. It’s titled “Playing in the Apocalypse.” That’s what my boyfriend called those times, and it has stuck with me ever since. I uploaded the manuscript late last night and am waiting to hear whether it needs more formatting before they can convert it for e-readers. I also ordered a cover design and am curious to see what they come up with. I will keep posting about the self-publication process—completely new to me. It was 1970. Kate and Joel were lovers during the riots in Isla Vista, a once sleepy, palm-studed, beachfront student community next to the University of California, Santa Barbara campus. For Kate, raised by repressive fundamentalist Christian parents, Isla Vista was the first place in her life that felt like home. She loved to browse the bookstore and take long walks along the beach. There were concerts and street dances just about every weekend… and then her world came apart. Kate’s apartment was right on the police patrol loop, where armored trucks full of cops shot the tires of parked cars and lobbed tear gas canisters at the apartment buildings. She and her roommate barricaded the door and hid in their apartment until something happened that galvanized them into action. In between the fires, the rage, and the night the bank went up in flames, a tender love story unfolded between Joel and Kate. It was a terrifying and life-changing year. Packed with details and drawn from the author’s own experiences, “Playing in the Apocalypse” is a time capsule of a scary, but in many ways simpler, era. 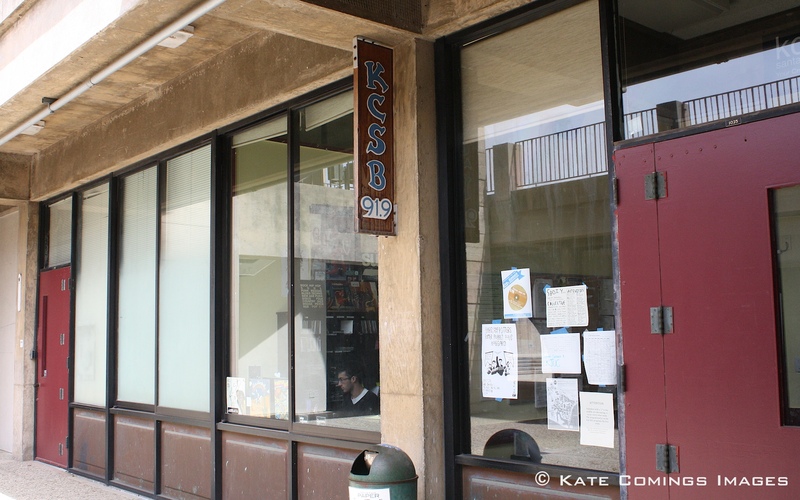 KCSB, the only radio station in the history of the United States to be shut down by police, April 17, 1970. Tags: Bank of America Burning, Isla Vista, Isla Vista Riots, police brutality, Self-publishing. Vietnam War Moratorium, Student protest, UC Santa Barbara, UCSB, Vietnam War, Writing | Permalink. Kate, Playing in the Apocalypse sounds really interesting, as does your life. Best of luck with it! Thanks Mary. I downloaded “Leaving the Beach” a while back and will be reading it next. Can’t wait! I can’t wait to read the final version of your book!! I love your writing, Kate. Such a great title! I can’t wait to have the book in my hand! You know I’ve been a huge fan of your writing pretty much all my life, and I’m looking forward to being able to share it with the rest of the world.